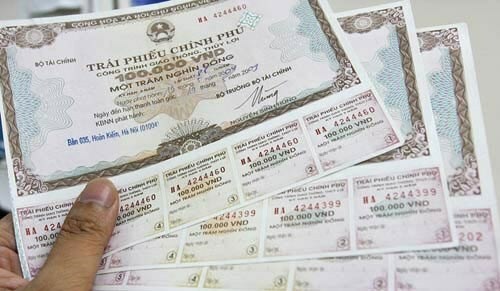 Hanoi (VNA) – The Hanoi Stock Exchange organised 38 auctions in August, mobilising a total of over 17.3 trillion VND (744.3 billion USD) worth of Government bonds, up 9.9 percent from the previous month. Of the amount, 16.06 trillion VND was raised by the State Treasury, while the remaining was mobilised by the Bank for Social Policies. The interest rates of successfully-bid 3-year bonds ranged from 4-5 percent per year, while those for 5-year bonds from 3.5-5.1 percent per year, and 7-year bonds at 3.9 percent a year. Ten-year bonds posted annual interest rates of 4.5-5.6 percent, and 15-year bonds, 4.81-6 percent per annum. The interest rates showed increases for bonds of all terms compared to those sold in July, excluding the 7-year term, which remained unchanged. On the secondary G-bond market, the total volume of G-bonds sold by the outright method reached over 560 million, worth 62.57 trillion VND, up 0.27 percent month-on-month. Meanwhile, the trading volume through repurchase agreements (repos) reached over 847 million bonds totalling 84.6 trillion VND, down 8.5 percent in value compared with that of July.